Chapter 30 Bubbles in Bread: Is the Answer in the Genes? Bubbles give novelty and distinctiveness to many food and drink products including the most important and interesting ones such as bread, beer, ice cream, whipped cream, soufflés and champagne. Understanding the creation and control of bubbles in food products is key to the success of the domestic chef or the industrial food manufacturer. This new volume presents the proceedings of the conference Bubbles in Food 2: Novelty, Health and Luxury. This book is fully updated and expanded from the original Bubbles in Food book published in 1999. This new title brings together up-to-date information on the latest developments in this fast moving area. Bubbles in Food 2 includes novel experimental techniques for measuring and quantifying the aerated structure of foods (e.g. ultrasonics, MRI imaging, X-ray tomography, microscopy, rheology, image analysis), and novel analytical approaches for interpreting aerated food properties and behavior. These techniques and approaches provide stimulus for new product development or for enhancing the understanding of the manufacture of existing products, leading to enhanced quality and greater product differentiation. 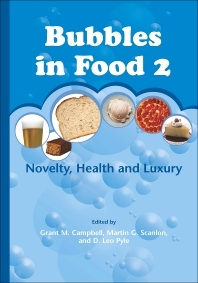 Bubbles in Food 2: Novelty, Health and Luxury aims to enhance the appreciation of aerated foods and to provide stimulation and cross fertilisation of ideas for the exploitation of bubbles as a novel and versatile food ingredient.